on December 7, 2016 at 1:33 am Švecka! | Tko je John Galt? When I look up data about GDP per capita from the World Bank (http://data.worldbank.org/indicator/NY.GDP.PCAP.CD?contextual=region&end=2015&locations=SE&start=1995&view=chart) I don’t get the same result. The earliest available data is from 1960. 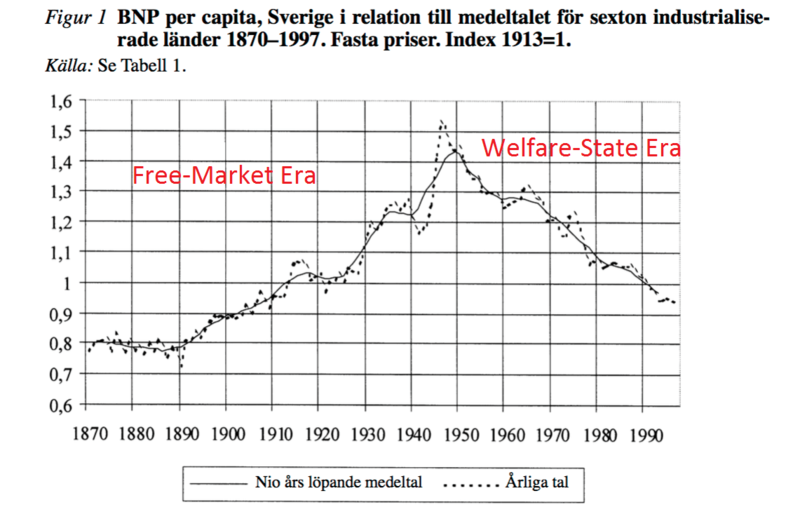 If you look at GDP per capita for Sweden divided by US it was 66% in 1960 and had risen to 103% by 1995. 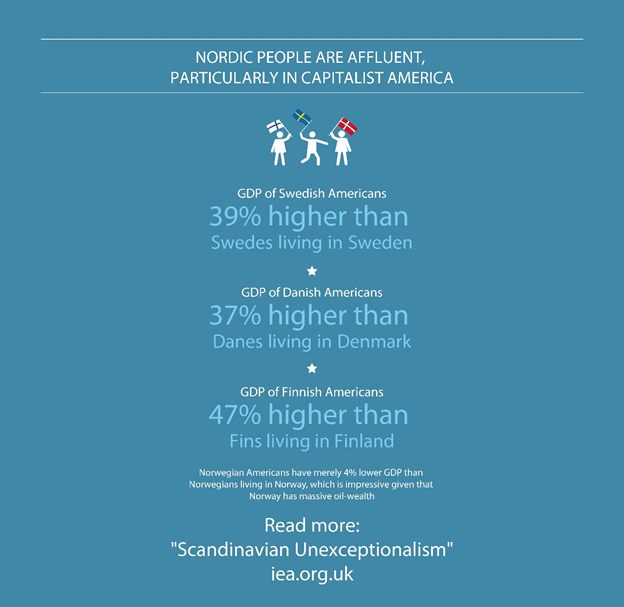 It matches Wolfram Alpha data (https://www.wolframalpha.com/input/?i=gdp+per+capita+sweden+vs+usa). And the development since 1995 looks about the same. 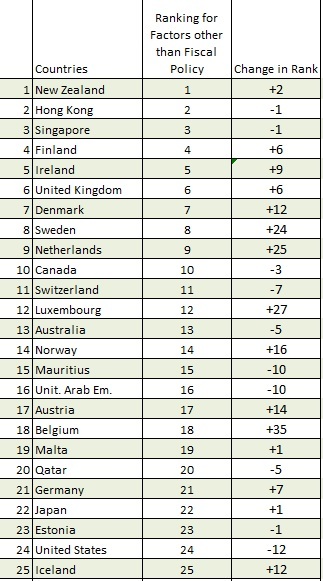 And the same applies when you compare Sweden to the average in the OECD countries. I’m trying to recreate figure 1. But simply cannot find any basis for it. I also tried france, uk, us, etc. Happy to see someone finally making a comparison to the only standard that matters in the long term: Average growth amongst nations. Though I think that, in the end, what really matters is growth relative to world average, not growth compared to other developed nations. Elementary arithmetic implies that developed nations who cannot keep up with average world growth — soon stop belonging to the group of developed nations. 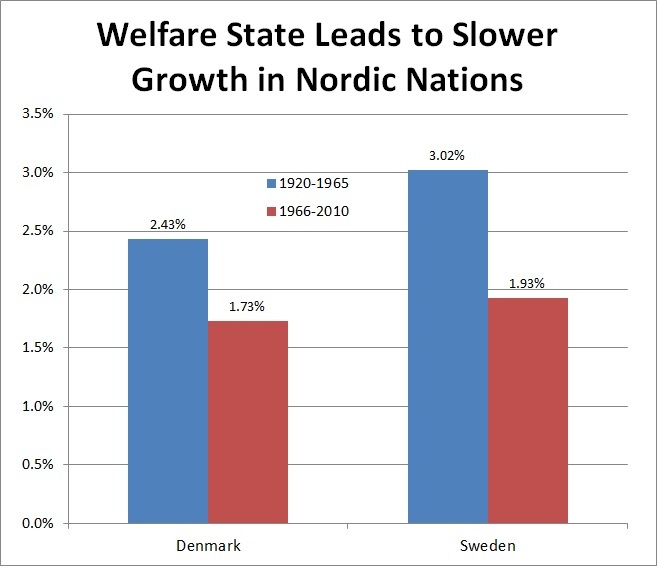 All policies, all laws, all culture, all attitudes, in the long term, boil down to the existential question: Is your country growing faster or slower than the world average? If the answer is NO then your days as a member of the developed world are numbered. On a 1-1.5% growth rate, in a world where average growth trendline is 3-4%, Sweden’s prosperity ranking continues to decline fast — deterministically. It does not take long for a 2-3% growth deficit to compound your prosperity into the world average. “Nice prosperity we have built! Now we can afford more redistribution”. Here’s the conclusion I draw from these charts: the rule of law, private property rights, democratic-republican (little ‘r’) governments, sound currency backed by gold, and market-based economies are such powerful forces for the betterment of civilization that you can throw bloated, inefficient, moral-hazard-inducing public sectors and central banks in the way and still do OK — for awhile, anyway. Which is why the century-long assault on this system by progressives is so infuriating — they’re trying to suffocate the goose laying the golden eggs.